Her freedom was hard won, without familial support and with scarce financial aid. Day was aware that most women her age labored in factories, shops or the home. Her high school Latin teacher Halsey Matteson recognized her talent and tutored her in Greek. It paid off. After a daylong exam where she translated portions of the Greek New Testament, Day won one of 20 scholarships worth $300 from William Randolph Hearst’s Chicago Examiner. When Day arrived on campus in the fall of 1914 she was directed to the Young Women’s Christian Association, where she found a room and work in the neighboring Y.M.C.A’s basement cafeteria. She bristled at its proselytizing and monopoly on campus employment. Her relationship with her supervisors at the Y soured. She claimed they disdained her “godless spirit.” They cut her off from most campus jobs. She suffered through a string of poorly paid domestic positions. In all but one of them, labor became a welcome toil, where scalded hands and soreness prefigured her devotion to St. Thérèse of Lisieux’s “little graces.” She found her first job in the home of John and Leora Fitzgerald, Methodists who were intellectually stimulating and kind. Day talked literature with John, a Spanish professor, and matters of faith while washing dishes with Leora. Day then kept house for Maurice Daly, a billiard hall owner and bootlegger. She was sexually harassed by Daly until she fled. In the home of Orr Allyn, a university extension instructor, she found a welcoming if poorer family. The Allyns barely paid Day, but she found more meaning in labor than school. So much so that she obtained exemptions from gym class, the forms for which survive in the university’s archive, in order to work in the afternoons. Day distanced herself from religion in “a conscious and deliberate process” and turned elsewhere for answers. Was a disinterest in religion the cause of her self-declared “godless spirit?” Unlikely: Day was versed in Episcopal hymns, the New Testament, John Wesley’s sermons and, a result of her mother’s conversion, Christian Science tracts. But she burned with the critical edge of youth and “scorned the students who were pious.” Though Day did list Christian Science as her religious affiliation every semester on university forms, she distanced herself from religion in “a conscious and deliberate process” and turned elsewhere for answers. She attended salons in the homes of progressive faculty and read feverishly. She devoured the works of her beloved Russians: Dostoevsky and Tolstoy. She amassed a library all her own with earnings from domestic jobs. Reading the working-class literature of Jack London and Upton Sinclair spurred a desire for action, but meetings of campus radicals, the Socialist Study Club organized under the auspices of the Intercollegiate Socialist Society, proved tepid. Day yearned for real change. She was willing to engage in protracted battles in defense of the working class and a dismantling of society’s oppressive structures—but the revolution would not begin in rural Illinois. She found the coursework too dull and uninspiring and the campus culture stifling. She did not return in the fall. Late in her first year of college, Day befriended Rayna Simons, “a character one meets but once in a lifetime,” and her boyfriend Samson “Raph” Raphaelson. Rayna and Raph were leaders in the campus literati but excluded from the Greek and social organizations that dominated the campus social scene because of their Jewish background. Intrigued by Day’s story recounting three days of hunger when she was only able to afford salted peanuts, submitted to Raph’s Illinois Magazine, the couple took Day out for coffee, which evolved into hours of conversation and a passionate friendship. During her sophomore year in 1915-16, Day joined campus honor societies and literary clubs and even dated a little—Raph introduced her to a Spaniard he knew through the Cosmopolitan Club. Day finally took P.E. and was elected captain of the sophomore field hockey team. Despite the stability provided by Rayna and Raph, school was untenable. She found the coursework too dull and uninspiring and the campus culture stifling. She did not return in the fall and followed her family to New York. 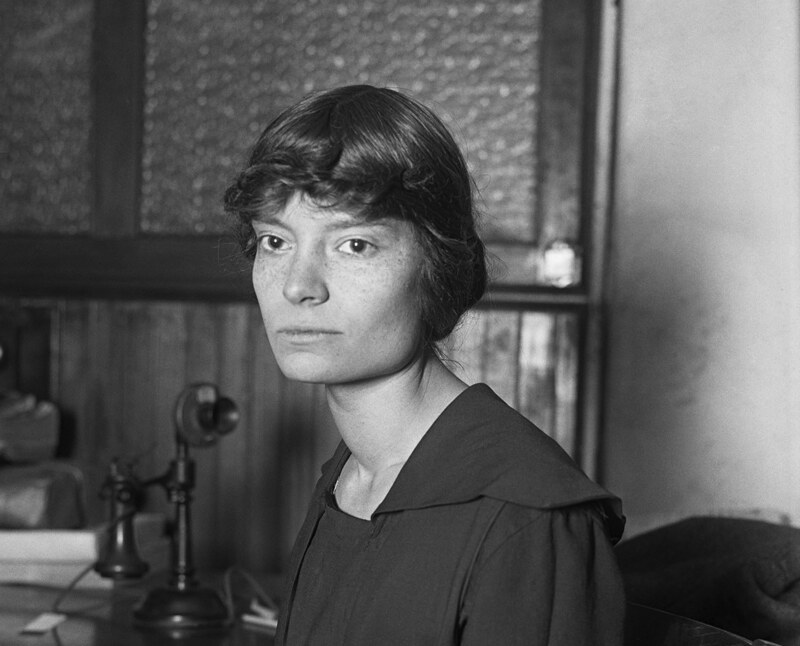 Dorothy Day was a saint of and for the secular age. Her familial relations were strained at the time, but she was not bothered by it. “In spite of the fact that [my brother] Donald and the rest of the family have kicked me out and would like to put me in a home for wayward girls, I’m awfully happy.” Day would ultimately find the independence, intellectual life and radical hope she first glimpsed in college in New York City, free from the stifling home atmosphere and Protestant manners of small-town Illinois. Day recounted college briefly in her memoirs, but in her last decade those two years and her connection to the University of Illinois returned to her private thoughts, recorded in her diary. Her ties to the University of Illinois also invited public controversy. The University of Illinois at Chicago Faculty Senate attempted to award Day an honorary doctorate in 1976. But Republican members of the board of trustees refused to sign off, concerned that granting an award to Day would signal the university’s support for international socialism. Day demurred. Four years prior she outlined her rejection of honorary degrees in Commonweal as an act of respect for “Holy Wisdom” and a rejection of the “military-industrial-agricultural-educational-complex-conglomerate” she saw at the heart of higher education. Day was a saint of and for the secular age. One of the few Americans under review for canonization with any college education—and the only one to attend a public university—her indiscretions and confusions, those awkward discoveries and repeated failures of youth, as well as the struggle to learn and better the spirit, are our own. She remains a witness for our moment, a teenager demanding answers of herself and the world, a nascent activist unimpressed with party politics, a writer finding her authors and, eventually, her faith. She had an abortion before she repented and became Catholic. St. Augustine and others lived in mortal sin, before conversion-- yet they are saints. Last I checked, baptism washes away sin. If she was already conditionally baptised, then she would have had an extensive confession: and would have been absolved. Many saints have "pasts". I appreciate learning more about Dorothy. I’ve read her autobiography, "The Long Loneliness", and Jim Forest’s biography, "Love is the Measure". Mr.Tye’s column pulls together neatly some key points about her scholarship, college days, her love of “The little flower”, her feisty spirit! I’m reading her diary (The Duty of Delight) and I rank it with Thomas Merton’s journals. Yes, Robert, she did have an abortion, confesses to it and lived with its guilt: ”My sense of guilt over promiscuity and abortion…” (Dec. 24, 1976). Her conversion enabled her to be most sympathetic towards the sinners she helped so much. albert scheweitzer was imperfect but do we doubt his life? We should all be so blessed as to repent as Ms Day has. She was a remarkable woman. My God Shine His Preputial Light Upon Her. The author is a doctoral candidate at a university studying hobos. Dorothy Day is an inspiration. Thank you for this article. What a cheap shot at Catholic sainthood. I have no wish to dishonour the dead and so will simply note that this woman was just another one of us, a fairly serious sinner who is alleged to have been repentant. I see no evidence of heroic virtue according to Judeo-Christian moral doctrine. There is not genius or brilliance or originality in her writings which have appeared in the scribbling of half a dozen other shallow socialist theoreticians. She is deemed of high virtue by Catholic socialists and some of the writings are counted as establishing a Catholic Social Justice Canon. Charity and compassion have nothing to do with politics and fraternal love is common to many people of any social class, ethnic group, intelligence or education. This "preferential option for the poor" is contrary to Christian charity where New Testament revelation specifies that in Christ there is "now no longer Jew or gentile, slave or freeman, male or female, ... " and it is clear that some wealthy people were part of his group of followers. I am curious about the origin of the rectitude and innocence of some of the allegedly Catholic commentators who hate rich people and powerful people - anyone prepared to give me a New Testament chapter and verse supporting this attitude as a virtue? Just quickly, I would say read Mk. 10:17-ff. Jesus didn't hate anyone. However, He was solicitious of the Poor, the Sick, or anyone who was in troubled circumstances, but who had faith or a good heart. His entire message was about Love. I am very grateful for this essay. I have always admired Dorothy Day because she cared for the outcast, for the worker and was filled with deep repentance for her own failings. If that's not a saintly person, I don't know who is. I am shocked at the mean-spiritedness and, in some case, "snark," of the comments here--and not only here, I might add. I am dismayed at the lack of basic Christian charity in the remarks in general on this website! Is this what the Catholic laity have become--the Pharisees of the 21st century? I am 76 and have been around for a while, but even when I was a kid, I do not remember such nastiness cloaked under the guise of Catholicism. Nathan Tye is a doctoral candidate in history at the University of Illinois at Urbana-Champaign where he studies hobos, homelessness and poverty in the late 19th- and the early 20th-century United States. Mr. Tye is a former Jesuit Volunteer and a graduate of Creighton University.